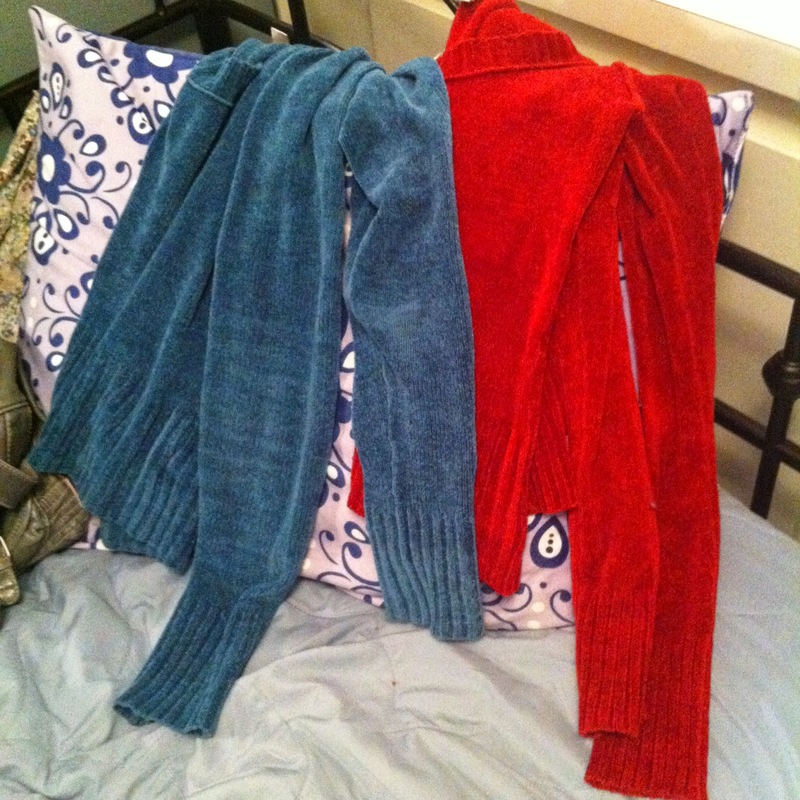 On impulse, I pulled these two sweaters out of my closet. They are beautiful sweaters, but they have started shedding copious amounts of chenille in the washing machine at my new place. The blue one has gotten quite thin on the shoulders, and when I went to put the red one (just washed) away tonight after hanging it dry, it dropped red clumps of fuzz everywhere. It also shedded all over two of my other sweaters, necessitating they be washed again, and this was with the gentlest possible cycle on the washing machine. So, they had to go. I need to buy a few new sweaters, but I will look for ones that are a little easier care. No room in a simple life for complicated washing instructions! I put the sweaters into a new donations bag that I just started, and when it fills up I'll take it to Goodwill or another charity. I really do think simple care instructions are important if you want to simplify your life. I've spent far too much time over the years taking care of hard-to-care-for clothing. It's okay for a few nice pieces that you don't wear that often, but not for daily wear -- especially when easy-care clothes are so easy to come by. I'm a little behind on my purging already, by the way -- about three days' worth -- but I will get caught up in the next few days. I know I have more to cull from my closet and my dresser, not to mention a mess of stuff in my room.